 Where: Expo New Mexico, (formerly New Mexico State Fairgrounds) Albuquerque NM.  Directions: San Pedro & Lomas NE. Take Interstate 40 to the Louisiana exit & go South. Today, it's known as "The Biggest Show in New Mexico." The New Mexico State Fair in Albuquerque started decades after most state fairs,. But unlike its trailblazing neighbors, it was an immensely popular hit from the outset. The first fair of 1881 ran a total of five days which attracted huge crowds despite the gloom of rainy weather. Even for these first fairs, (which began before New Mexico was even an official state) business owners knew knew an opportunity when they saw one, and invested heavily. Crowd pleasing trapeze artists and other daredevil acts - like parachute jumpers who jumped from hot air balloons - eventually earned the fair a reputation as being one of the greatest annual events in the Southwest. 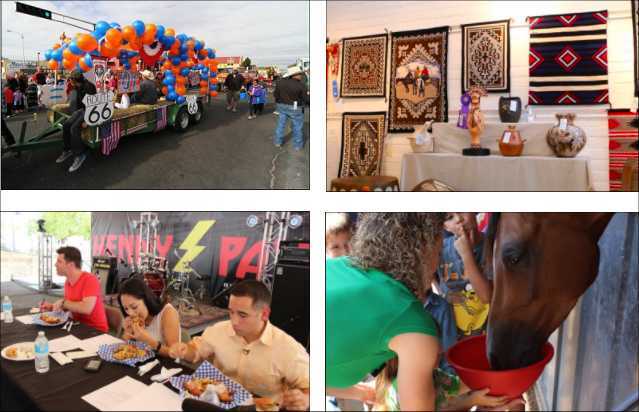 This year, the New Mexico State Fair is a 11-day event that kicks off on Thursday, September 5 and runs until Sunday, September 15, 2019. Entertainment, of course, is still a big draw along with artisans, performers, and food vendors showcasing the state's rich Spanish and Native American heritage and culture. Not to be outdone by rivals, the New Mexico State Fair closely follows an All-American venue featuring livestock shows and exhibits, as well as cooking and gardening competitions. DNCE, Dustin Lynch, Dan + Shay, and Collective Soul. The New Mexico State Fair concert lineup has in the past included such star headliners as Josh Turner, Randy Travis, Tanya Tucker, and many others. This year, the full 2018 concert and entertainment schedule was announced May with individual tickets going on sale in late July. For more information about concert tickets, see the official site online or at Ticketmaster outlets. Early purchase of tickets includes gate admission to the Fair. General admission prices usually run about $7 for adults (that means age 13 and older.) Special discounts are available for kids and seniors. Children under 5 get in free. Additional fees are charged for carnival rides with special discounts for parties of 25 or more. Another great New Mexico State Fair tradition? The big parade! -- as the festivities step outside the fairgrounds to march, sing, and dance down Central Avenue. This year, watch for the grand procession to commence at 9AM on Saturday, September 7. 2019. Rodeo and bronco riding extravaganzas, and mariachi music (as well as local ethnic bands) usually round out the attractions that offer family-friendly fun for anyone traveling through New Mexico at summer's end. Step right up to see the Aqua Mules! • Because so many students were skipping school to attend the Fair, Albuquerque schools closed for a week-long vacation during the Fair in 1906. • In 1964, the New Mexico State Fair became the first state fair in the country to have an exhibit solely devoted to Native American art & culture. • In 1985 the first-ever tornado in Albuquerque's history touched down near the fairgrounds during the State Fair, and immediately afterward vendors offered T-shirts that read: "I survived the Albuquerque tornado". • The Fair hosted high-diving "Aqua Mules" until 1991 when public protests ended the controversial show. • Today, the New Mexico State Fair is usually ranked as among the Top Five state fairs in the nation in terms of attendance and attractions. The big parade - plus food, local arts and crafts, and kid-friendly attractions are all a part of the fun at the Fair. New Mexico State Fair - Check out the official site with information on admission and ticket prices, fair highlights, entertainment line up, and events including food concessions, kid-friendly attractions, directions, map, photos. New Mexico State Fair - A Complete Guide - Trip Savvy.com guide offers highlights, details on admission, complete schedule including rodeo and parade times, related resources.